When the original MGM Grand Hotel opened in 1973, it was the most lavish hotel on the Las Vegas Strip. Every facet of the hotel oozed with class from its casino that was the size of three football fields, to its MGM themed high-end gourmet restaurants such as Gigi's, Barrymores and Tracey's. Chandeliers were everywhere. The shopping area, located downstairs from the main casino floor, was filled with high-end stores and at the end, a movie theater that played classic studio era MGM films. It was a hotel to remember. But in 1980, an early morning fire changed forever the way we remember that beautiful hotel. There were, by estimates, 5,000 guests staying the luxury hotel on the morning of the fire. It was the deadlist hotel fire in Nevada history and the second deadlist in American history. 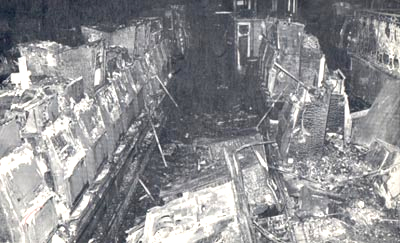 On November 21, 1980, early in the morning, a fire, that had started hours earlier, broke through a wall soffit in The Deli and roared into the casino. The fire had been sparked by wiring inside the soffit. That wiring powered the refrigeration unit for a nearby food cabinet display. The vibration of the rotating cabinet had caused the wiring to fray and the wires rubbed together. The fire began there and burned for a while, undetected. Had the Deli still been open around the clock like it had been when the hotel originally opened, the fire would likely have been spotted and contained easily. Unfortunately, the Deli no longer was open 24/7 and the fire began while the Deli was closed for the night. One of the workers on a marble and tile replacement crew entered the Deli to check for broken tiles and noticed a flickering light. On closer inspection, he discovered the fire. He immediately called security and went looking for a fire extinquisher. He tried to contain the fire but as it grew bigger he realized that not only was his life in danger but casino patrons and other workers were as well. He opted to warn as many of them as he could. Firefighters from nearby stations had arrived and were making their way to the Deli which was now enveloped in black smoke. They were barely 40 feet inside the hotel when a fireball roared out of the Deli and through the casino gaining speed as it raced across the three football fields burning everything in its path. Later estimates by the Clark County Fire Department clocked the speed at 15 to 19 feet per second! Many of the elegant touches like the wall paper, the paintings of famous MGM characters, the carpet and more fueled the fire as it raced. It finally roared out the front doors of the hotel destroying everything from the slot machines inside to the cars parked waiting for the valet. Seven people were killed inside the casino area. The fire fueled with toxic smoke had only one place to go and that was up. Due to faulty smoke dampers, the fire was able to get into the hotel ventilation system. Don Feldman was a baker on duty that morning. Along with John Scott and Clarence White, he had stayed behind when word began to spread of a fire. As he explained at a panel discussion on the subject that I moderated two years ago as part of "Untold Stories", he felt that staying behind to continue working wasn't putting himself in danger because, after all, it was the MGM and surely they would take care of the problem before it got too big. As the smoke intensified and the lights began to flicker, Feldman realized that staying behind perhaps wasn't the best choice. The three men sought refuge in the walk-in freezer. As time passed, Feldman would go out and try to raise someone on the phone to let them know where they were. The phone line was dead. Clarence White finally decided to go for help. While White was gone, Feldman wrote a message on the back of pie liner. He began to think they might not make it out alive. When they could take the cold no longer, Feldman and Scott decided to try and find a way out. As they inched down the dark and smoky hallway, they found White's body. He had died of a heart attack. They made their way to the stairs and up to the casino area. The casino was covered in water and windows were blown out. Bodies were strewn about. But, luckily, firefighters saw them and helped them to safety. Elsewhere, the toxic smoke was making its way through the ventilation system. Hotel guests were roused by other guests in the hallway or by knocks on the door. The fire alarms were strangely quiet. Many guests opted to take the elevators down to the casino. Of those that did, many died in those elevators. Others ran towards the stairs and began the descent down. Many encountered thick black smoke and had to turn back. While some returned to their rooms (those who had their room keys could, those who left them behind on nightstands and in purses found themselves locked out), others raced up the stairwell for the roof. As the fire raged on, guests could be seen on balconies and at windows begging for help. Helicopters from around the valley, including Nellis Air Force Base, helped rescue rooftop guests. Some 2,000 guests made their way to the rooftop hoping to be rescued. Fire ladders only went as high as the 9th floor but the hotel was 26 stories tall. Guests on higher floors screamed for help. Some jumped. Hotel workers used scaffolding to try and reach and rescue guests on higher floors. Less than two hours after the alarm was sounded, the firemen had the fire in the casino under control and were busy evacuating people floor by floor. It became a race against time. The thick, black smoke, filled with toxins, moved swiftly and quietly throughout the air conditioning and ventilation systems. Guests who were sleeping through the fire died in their sleep of smoke inhalation. 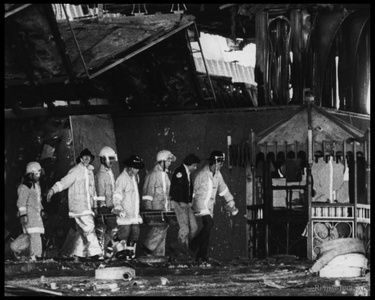 84 people died on that tragic day with another three dying later of injuries sustained during the fire. The MGM Grand fire led to lawsuits and trials. As the pictures above show, the casino area was destroyed. Smoke and water damage on the lower level destroyed many of the fabled shops. The hotel closed and was rebuilt. But the damage couldn't be repaired to the psyche of the American conscience. Kirk Kerkorian, the owner of the hotel, sold the hotel to Bally's. The fire changed the way hotels were built in America. Now every room is equipped with fire sprinklers, each room comes with a binder that explains evacuation routes in case of fire, elevators are now disabled when the fire alarm sounds. Much of the original MGM Grand still stands, its lovely bones still there amid all the remodeling that Bally's did. For more on that, click here. The Las Vegas Strip is very different today than it was 30 years ago. But because of the tragedy of the MGM Fire, hotels in Las Vegas and around the country are now safer to stay in.